Though higher education marketers and admissions counselors work year-round to attract and retain students, one of the most impactful moments for an admissions campaign is the acceptance offer. A well-crafted acceptance package is a door opener that sets your admissions team up for success throughout the campaign cycle. Students are becoming more discerning in their college search, and are applying to more schools than ever before. That means there’s even more pressure to deliver on their expectations. 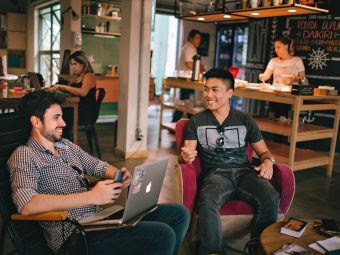 To that end, here are some recommended best practices for getting the most out of your acceptance package. Prospective students have been looking forward to their acceptance notification for ages. They’ve poured countless hours into researching schools, completing applications and touring campuses in search of the right place for them. Many have dreamed of this moment for years, and now that their application is in, it’s time to deliver a sense of accomplishment—and excitement—about being accepted. The psychology of excitement in marketing makes it clear that behind these strong emotions is an innate impulse toward action. Students can be major influencers within their peer group, and building on that initial excitement by providing an experience that includes clear, actionable next steps is a great way to spread the message of your institution far and wide. Inside the acceptance package for Florida Polytechnic University, students are treated to their own augmented reality fireworks show over the top of the Innovation, Science and Technology building with a celebratory “You’re In!” message. The interactive experience not only makes for an exciting announcement, but does so in an innovative and unexpected way. In the same experience, Florida Polytechnic University also gives students the ability to instantly make their deposit from their mobile device which makes the next step easier to complete. Acceptance packages come in all shapes and sizes—some schools send a simple letter, while others go all-out with a variety of materials designed to dazzle students into submitting a deposit. Breaking through the clutter is important, especially when prospective students are more overloaded with college decisions than ever before. Three-dimensional “lumpy” mail is a great way to showcase your school’s unique culture while showing prospective students that you’re making a real effort to impress them. University of the Ozarks uses a self-mailing box filled with great information and university swag to reinforce the excitement of the acceptance announcement. 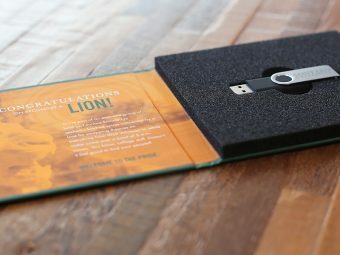 Although much smaller, Saint Leo University’s acceptance package stands out by going digital with an enclosed USB loaded with all of the next-step information accepted students will need to make their final decision. If you’re looking for engagement, give your audience a #humblebrag moment. 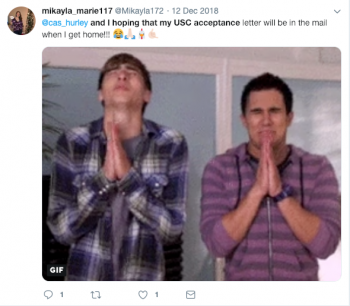 With the acceptance letter, it’s pretty much baked in, but a prominent call to action and an ownable hashtag can help remind students to share their great news. Naturally, accepted students are going to post their acceptance, but you can make the moment more Instagrammable by cheering them on in your own unique way. Students accepted into Middlebury College show their pride on Instagram. 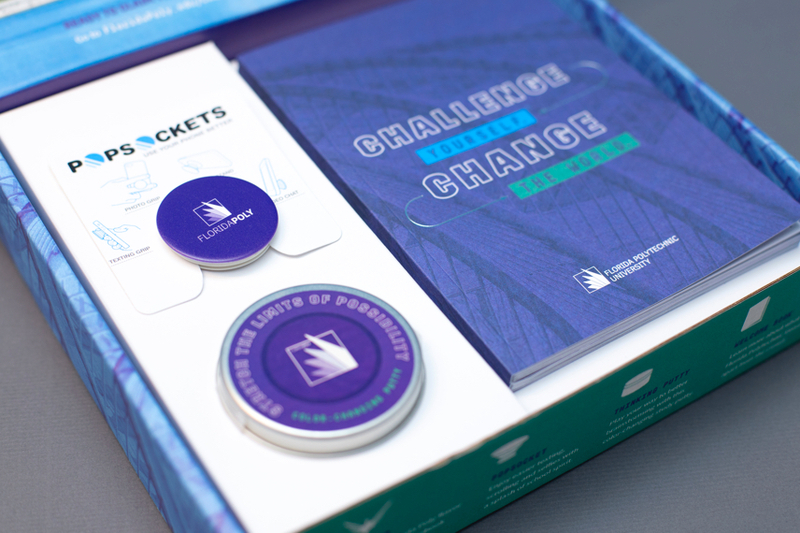 Pamela Fogg, Creative Director at Middlebury College, updated their package to become a bright, colorful and buzzworthy touchpoint by incorporating a pennant wrap around the outside of the folder. 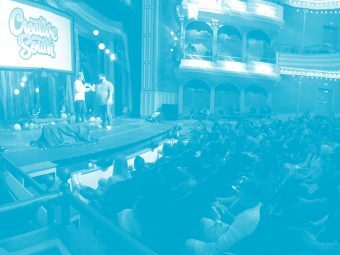 She brought together her team including designers, social media managers, and others to weigh in together in a heavily iterative and collaborative process and created something unique that could garner attention and build excitement for accepted students. One of the most surprising facts about the campaign was that it received the strongest social media response from non-traditional and first-gen college students. While the presentation of your acceptance package is important to the success of the campaign, your chief goal should always be to convey the culture of your institution in an authentic way. This is your opportunity to show students who you are and why you feel they’ll find the best fit for them within your walls. 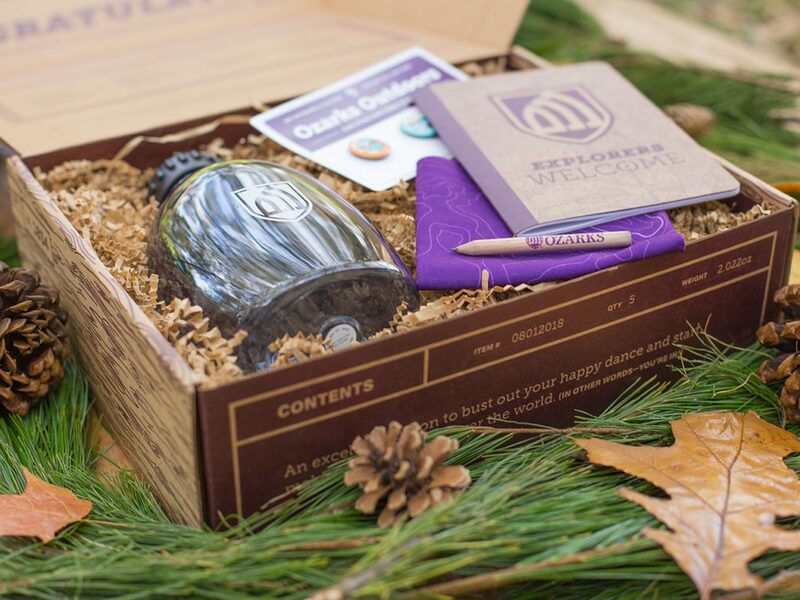 University of the Ozarks uses their admissions package to drive home a compelling story inspired by the outdoors. Rather than trying to hide the school’s rural setting, the Ozarks acceptance package leans into it, with messaging that emphasizes the university’s outdoor appeal. This is the place where it’s important to embrace your true brand and showcase its benefits to prospective students. Knowing and understanding who you are is the surest path to identifying right-fit students and increasing your institution’s retention rate. For Florida Polytechnic University, the acceptance experience looks completely different. While there was considerable effort to “wow” prospects, close attention was paid to demonstrate the innovative nature of this STEM-focused school. An augmented-reality-infused box and a welcome booklet were created to help highlight the university’s campus, students and high-tech labs. So far, the campaign has garnered hours of engagement from admitted students, resulting in an impressive start to the early stages of their current admissions cycle. The best-laid plans in today’s marketing ecosystem always have a digital component, and acceptance is no different. After the confetti has fallen, there’s still work to be done. Your acceptance package should drive the user to complete their deposit online, and should immediately allow them to see what remaining follow up needs to be completed. One of the fundamental beliefs of our agency is that usability is an ideal opportunity for organizations to express empathy. The easier you make it for students to complete next steps, the quicker you’ll see results. A sharp-looking microsite, like the one used for admitted students at Saint Leo University, can be a useful tool for keeping students on-task. Instead of letting the excitement wear off, Saint Leo’s acceptance package drives students to a microsite that provides everything they need to commit, including step-by-step instructions on how to deposit and a centralized list of admissions FAQs. While admit packages are a powerful tool at your disposal, they lose their punch when they’re viewed as an isolated tactic. 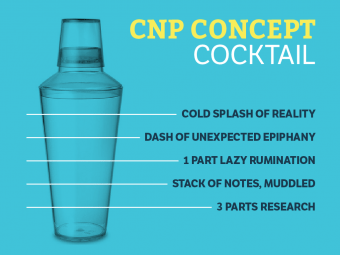 Ultimately, a splashy admit package is making a promise that your larger campaign and the institution as a whole needs to be ready to deliver on. So as you move forward planning your upcoming campaign, consider how this moment can be thoughtfully crafted from every angle to make your institution the unmistakable choice. Martin is a self-taught Photoshop phenom and social media branding expert who knows that pushing the envelope starts with pushing yourself. 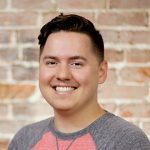 He joined the Echo Delta creative team in 2014 after a five year stint as graphic designer and marketing manager for Bok Tower Gardens.